The Indianapolis Motor Speedway Museum is set to celebrate Indiana grassroots racing at, ironically, the world’s largest sports seating facility. “Hoosier Thunder: Indiana’s Short Track Heritage” is the IMS Museum’s newest exhibit and will open Thursday, Nov. 8. Hoosier Thunder tells the story of the many drivers and families who have made short-track racing a way of life, proudly carrying surnames such as Carter, Darland, Elliott, Kenyon and Kinser. It also honors the drivers who have raced in Indiana on their way to superstardom, such as Tony Stewart, Jeff Gordon and Ryan Newman. The famed Speedway draws the most global attention among Indiana’s racing venues, but many of America’s top aspiring drivers have known for decades there was one place to go to hone their skills and earn a winning reputation: the dirt and pavement short-track “bull rings” scattered across the Hoosier State. 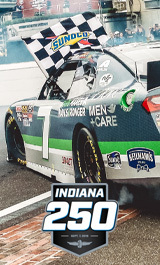 “If you’re racing on short tracks in Indiana, it means you’re racing against the best of the best, as far as new and veteran talent,” said Stewart, a three-time NASCAR Cup Series champion, 1996-97 IndyCar Series champion and one of the most decorated short-track racing stars in history. “I learned more racing in 30-lap features on dirt and paved ovals than I did the rest of my career. It’s where I learned how to set up handling, take care of my equipment, and just learned what it took to win. The stories will be told through displays of numerous modern and vintage USAC (United States Auto Club) Midget, Sprint Car and Silver Crown race cars, plus memorabilia on loan directly from drivers and team owners, along with incredibly rare items in the IMS Museum collection. Hoosier Thunder, which is made possible by exhibit sponsors Driven2SaveLives, Toyota and Hoosier Racing Tire, will remain open until April 21, 2019.